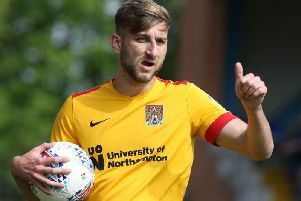 former Peterborough United and Leyton Orient defender Simon Clark has joined the Cobblers Academy staff. The 51-year-old takes up the role as the lead youth development phase coach at the PTS Academy Stadium, overseeing the development of players in the Town Academy from the age of 13 to 16. He comes to the club as a replacement for Mark Lyons, who left a similar role last month to take up a post at Premier League Leicester City. As a player, Clark made nearly 300 senior appearances for the likes of Posh, Orient, Colchester United and Stevenage Borough. He has since moved into coaching, and has earned a UEFA A qualification. Clark has worked in the Lincoln City centre of excellence, as well as coaching the Imps first team, and enjoying a short term as caretaker boss at Sincil Bank in 2009, and has also been the Peterborough centre of excellence co-ordinator. He has also worked in non-League management with a variety of clubs, with his most recent role being as manager of King’s Lynn Town. Head of Academy Kieran Scarff, who only started his role in January, is delighted to welcome Clark to the club, and said: “Simon is an excellent appointment for us. “He has a wealth of experience as a player and as a coach and he has a fine record of working with young players. “As I found when I arrived a couple of months ago, Simon will find an Academy in excellent shape with a first class infrastructure that is strengthening further and an environment to help young players become the best they possibly can be.